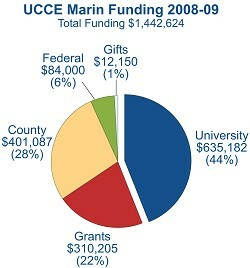 Our programs operate through a unique partnership between the County of Marin, the UC system, support from the USDA, and other private funds. Backed by the resources of the UC campuses, our educational programs use practically applied research information to solve community problems. We consult with individuals and organizations, publish newsletters, conduct local applied research, produce information for mass media, and conduct seminars and workshops. For every $1 contributed by Marin $4.9 was contributed by other sources.